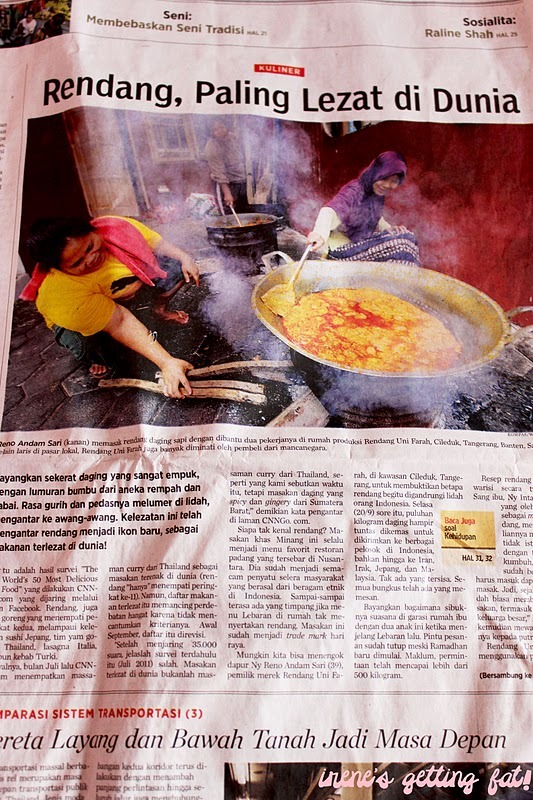 Kompas newspaper article; the title says "Rendang, The Most Delicious in The World"
I don't read newspaper much so I just know this recently. Rendang and nasi goreng (Indonesian fried rice) are the first and the second world's most delicious food! Woo hooo!! That's the result from a survey called 'World's 50 Most Delicious Food' CNNGo.com did, via Facebook. At first, CNNgo.com already had a list about world's 50 most delicious food in July, but many complained as the criteria were considered not clear. so they made a new one in September. On the newest list, rendang from Minang, West Sumatra, occupied the first place, followed by Indonesian fried rice in second. Sushi, tom yam goong, and pad thai take the third, fourth, and fifth place respectively. As for my fav food, dim sums, they hold the seventh place. Although rendang is not the first place on my own most delicious food list, I agree that rendang is devilishly good. Who can resist the tender and supple beef, slow cooked so it's not at all chewy and perfectly marinated with fragrant and tasty spices? I suspect only vegos can do that. For fried rice, I also agree that Indo's fried rice is the best than other country's fried rice (no offense). I loveeeee fried rice. Especially Indonesian. Anyways I really recommend you to read the article yourself. Have a judge yourself whether the list does the food justice or not. Personally, I am quite happy reading the list. You can also check out the article on Kompas newspaper, September 25, 2011 on the first page.